See "Children in the vehicle" for further information on infants and children traveling in the vehicle, as well as on child restraint systems. CORRECT USE OF SEAT BELTS • Seat belts only work properly if they are fastened correctly. Never wear seat belts in any other way than as described in this section, as that could result in serious injuries in the event of an accident. • All occupants should wear their seat belt at all times, because seat belts help reduce the likelihood of and potential severity of injuries in accidents, even if the vehicle overturns. The restraint system installed is equipped with SRS (driver's air bag, frontpassenger air bag, window curtain air bags), belt tensioners and belt force limiters. The system is designed to enhance the protection offered to occupants who are wearing their seat belts correctly, in certain frontal impacts (front air bags and belt tensioners) and side impacts (window curtain air bags and belt tensioners) which exceed preset deployment thresholds. • Never route the shoulder section of the seat belt under your arm, across your neck or anywhere other than across your shoulder. In the event of a frontal impact, your body would be moved too far forward. This would increase the risk of head and neck injuries. The seat belt would then apply excessive force to the ribs or abdomen which could cause severe internal injuries to organs such as the liver or spleen. Adjust the seat belt so that the upper part of the belt is as close as possible to the center of the shoulder. It should not touch the neck. Never route the belt under the shoulder. The height of the belt outlet can be altered to ensure correct usage. • The lap belt should be routed as low as possible across the hips, not across the abdomen. If the lap belt is routed across the abdomen, it could cause serious injuries in the event of an impact. • Never route the seat belt over rigid or fragile objects in or on your clothing, such as eyeglasses, pens, keys etc, as this could cause injuries. • Always ensure that the seat belt is routed correctly. This is particularly important if you are wearing loose clothing. • Only one person should use each seat belt at any one time. Never use a seat belt to restrain more than one person or route the belt around additional objects. • Never wear seat belts when they are twisted. Otherwise, in the event of an impact, the full width of the seat belt is unavailable to distribute the force of the impact. The twisted seat belt routed across your body could cause injuries. • Pregnant women should also wear a threepoint seat belt. The lap belt must always pass across your lap as low down as possible, i.e. across your hips; not across your abdomen. 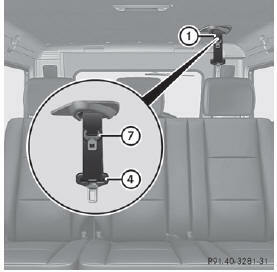 • The seat backrest should be set as close to vertical as possible. • Check the seat belt during the journey in order to make sure that it is correctly positioned. • Never rest your feet on the dashboard or the seat. Always keep both feet on the floor in front of the seat. • When using a seat belt to secure an infant restraint system, child restraint system or a child on a booster seat, always follow the child seat manufacturer's instructions. Children 12 years old and under must never ride in the front seat, except in a Mercedes- Benz authorized BabySmart™ compatible child seat, which operates with the BabySmart™ system installed in the vehicle to deactivate the front passenger front air bag when it is installed properly. Otherwise they will be struck by the air bag when it inflates in a crash. If this happens, serious or fatal injury will result. 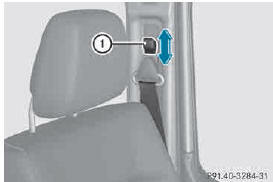 ► Adjust the seat and move the backrest to an almost vertical position . 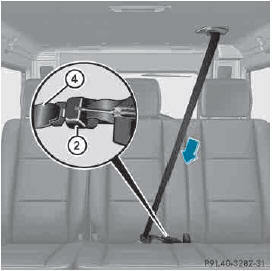 ► Pull the seat belt smoothly through belt sash guide 1. ► Without twisting it, guide the shoulder section of the seat belt across the middle of your shoulder and the lap section across your hips. ► Engage belt tongue 2 in buckle 3. ► If necessary, adjust the seat belt to the appropriate height . ► If necessary, pull upwards on the shoulder section of the seat belt to tighten the belt across your body. Further information on releasing the seat belts with release button 4. ► Pull both seat belt tongues 4 and 7 from bracket 1. ► Engage fixed seat belt tongue 4 in buckle 2. 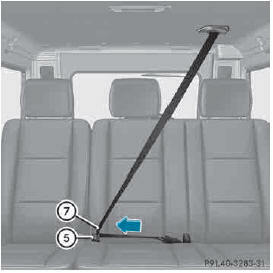 ► Pull movable seat belt tongue 7 and route the seat belt across your body. Without twisting it, guide the shoulder section of the seat belt across the middle of your shoulder and the lap section across your hips. ► Engage movable seat belt tongue 7 in buckle 5. Further information on releasing the seat belts with release buttons 6 and 3. All seat belts in the vehicle with the exception of the driver's are equipped with a special seat belt retractor, to which a child restraint system can be secured. 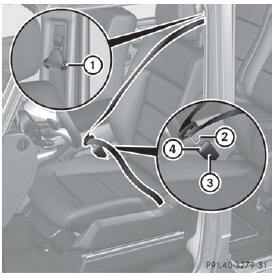 For further information on the "special seat belt retractor" . You can adjust the belt height on the driver's and front-passenger seat, as well as on the outer rear seats. ► To raise: slide the belt sash guide upwards. ► To lower: draw belt sash guide release 1 forwards and hold it. ► Slide the belt sash guide downwards. ► Let go of belt sash guide release 1 and make sure that the belt sash guide has engaged. ► Press release button 4 of buckle 3 and guide belt tongue 2 back towards belt sash guide 1.
the instrument cluster is a reminder for all occupants to fasten their seat belts. lamp lights up for six seconds each time the engine is started. It then goes out once the driver and the front passenger have fastened their seat belts. If the driver and/or front passenger have not fastened their seat belts after the engine has been started, an additional warning tone sounds. This warning tone switches off after approximately six seconds or once the driver's seat belt is fastened. warning lamp lights up. A warning tone also sounds with increasing intensity for a maximum of 60 seconds or until the driver or front-passenger seat belt has been fastened. seat belt warning lamp flashes again if the vehicle speed again exceeds 15 mph (25 km/h). seat belt warning lamp . Pyrotechnic ETDs that were activated must be replaced. For your safety, when disposing of the pyrotechnic ETDs always follow our safety instructions. These are available at any authorized Mercedes-Benz Center. ► In order to ensure that the pyrotechnic Emergency Tensioning Devices have not been triggered, always have the seat belts checked after an accident. 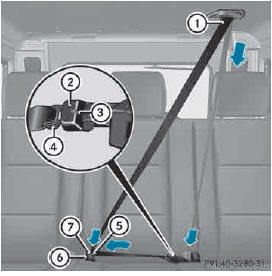 The seat belts for the front seats and rear outer seats are equipped with ETDs and seat belt force limiters. The ETDs on the driver's and front-passenger seat consist of pyrotechnic belt buckle tensioners and belt anchor installation tensioners that are triggered together. The belt buckle tensioner is mounted on the Bpillar and the belt anchor installation is mounted on the side of the seat. After deploying, both tensioners must always be replaced. When triggered, seat belt force limiters help to reduce the peak force exerted by the seat belt on the vehicle occupant. The front seat belt force limiters are synchronized with the front air bags, which take on a part of the deceleration force. Thus, the force exerted on the occupant is distributed over a greater area. If the ETDs are deployed, you will hear a bang, and a small amount of powder may also be released. Only in rare cases will the bang affect your hearing. The powder that is released generally does not constitute a health hazard. The 6 SRS warning lamp lights up.